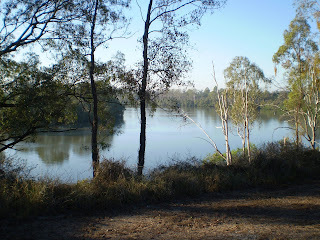 Knowing place reflects an intimacy with the elements of that place, the trees, the animals, the human visitors and, in the case of this blog, the Brisbane River. American nature writer, novelist and preservationist Wallace Stegner (1992) says that: 'Your province is not the wilderness, where the individual makes contact with the universe, but the farm, the neighborhood, the community, the town, the memory of the past, and the hope of the future—everything that is subsumed for you under the word 'place'. Along the river, away from the road and signs of the city, the tall trees shimmer with the song and dance of birds. Flashing past overhead, in colours of red and green, the King Parrots are being pursued by a small gang of Noisy Mynahs. Miniscule pardalotes parade daintily on narrow branches above the water, while the blue-winged Forest Kingfisher fossicks among the leafy bushes, purring and gurgling as it searches for tasty treats. And right in front of me, the jauntily-dressed black and white Willie Wagtail wiggles its tail feathers back and forth as it hops from branch to branch as if leading the way. Watch out! The Brush turkeys scatter as runners zip past. Dogs bark, straining on their leashes to follow them. The river is brimming with life and movement. Getting to know place is a joyous adventure. It involves making friends with the locals, human and animal, observing the changes in the light, the colour of water, the shifting seasons, the cycle of flowers and seeds, and the changing tapestry of hues. All these events, sights and sounds effectively bring me home to place. Steven Galliano and Gary Loeffler are landscape architects in the US who have studied the connection between sense of place and attitudes to the ecosystem. In their paper Place Assessment: How People Define Ecosystems (1999), they recognize the significance of place attachment, saying it acts as a link between human and ecosystem as well as between social experiences and geographical regions (bio-regions). According to Galliano and Loeffler, the concept of sense of place is individualistic, a subjective yet shared experience at once emotional and symbolic, which can define an individual, a community or a culture. Sense of place brings meaning to the lives of visitors and residents alike, affecting them in various ways from the physical to the spiritual. Feelings of attachment, allurement and love emerge as people engage with local places, reflect on their memories of place, tell stories of their childhood connections - the cubbies they built, the fish they caught, the trees they climbed, and track their life changes through the changes to place. Even if we've never visited a particular place we can still value it for its symbolic resonance, its wilderness quality and its spiritual attributes and join with others to fight for its protection and survival. Yet these values are often bypassed in resource management practices as such practices are geared to defining places as 'resources' rather than, or in addition to, places which have meaning and can make meaning. Galliano and Loeffler call for a different way for resource managers to make decisions about place. Place management and place attachment seem poles apart when development, mining or logging intervene. Different groups of stakeholders value places from differing and often clashing worldviews but it's not worldviews that are weighed up in resource management decisions. Their focus is on the physical, the objective, the measurable. Thus concepts like affinity and attachment to place which embrace emotional, symbolic and spiritual dimensions are neglected, and in many cases, rejected as being unscientific, subjective and weak. As a consequence, the social and spiritual impacts of decisions can result in a strengthening of social/community capital as whole communities may decide to join together to defend what they regard as their place, or our place. Shared meanings about place become shared meanings about attempts to despoil that place. Meanings about place can be classified in four main ways: (i) scenic-aesthetic; (ii) activity-goals, based on conventional resource management practices (iii) cultural-symbolic, representing emotional and spiritual dimensions; and (iv) individual-expressive, reflecting personalised or individualised meanings about place. Galliano and Loeffler suggest these themes can be used to better qualify management decisions and the likely impacts of those decisions. Using holistic principles, resource managers can more effectively map 'the interactive unity of people and place' (Clark, 1971), taking into account the multiplicity of values about places, not only the economic and/or the ecological. Resource management processes and environmental impact assessments as they are currently structured often fail to address the intangible non-empirical values and shared experiences of individuals and communities. Galliano and Loeffler mention that one of these unmeasurables is compassion for both natural and cultural qualities of the place. The Brisbane River and its natural environs is a place of values in conflict where management practices are based on conventional rather than holistic methodologies. I call such approaches 'neo-conservationist' as they attempt to conserve with conservativism. Rather than applying the precautionary principle of first do no harm, the neo-conservationist stance conserves use values over their counterpart, the intrinsic, aesthetic, symbolic and spiritual values, even if these values are founded on scientific evidence, indigenous ecological knowledge or archeological research. What matters most? Biodiversity or a river view? A place to fish or a place where fishers are repelled? A place to clear or a place to log sustainably and look after? Techno-managerial solution oriented approaches may overlook the nuances inherent to these questions. A sustainable community can have both biodiversity and aesthetics, fishing and rivercare, urban forests and sustainable development. Knowledge and understanding are key characteristics of resource management but perhaps, following Galliano's and Loeffler's research into place attachment, qualities of wisdom, insight and compassion should be added, to forge a holistic method that embraces the interactive unity of people with place. Stegner W, 1992, The sense of place, a letter to Wendell Berry. In: Where the bluebird sings to the lemonade springs: living and writing in the West. New York, Random House, Inc.